It’s been several weeks since I last posted. It wasn’t that I had forgotten about my site, I just wanted to take a moment to step back and live in the now. 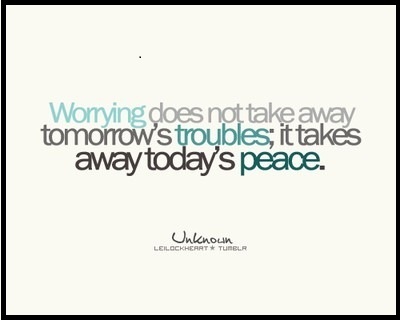 I have spent all my life either dwelling on the past or worrying about the future. One of the valuable lessons I have learned due to having osteonecrosis is to live in the moment and embrace the good that I am experiencing now. Mid February I had new MRIs performed. When my doctor went over the results with me he could still see evidence that my disease had not progressed. It has never reached my knee joints and there were patches on the MRI where bone has started to heal itself. At first I was very excited about the news. My husband and I celebrated that night by going to one of our favorite restaurants in our neighborhood. However, the next day I woke up with doubt in my mind, I spent all day driving myself crazy wondering if he misread the MRIs. I was thinking why should I be so lucky. Can this really be true. At the moment I can only walk about 8 blocks with my cane and can stand for about 20 minutes without having pain and fatigue. I still take tramadol three times a day. I forget that a year ago at this time I couldn’t walk at all and standing was impossible. However, his prognosis seemed too good to be true. I ruined the moment for myself. I ruined the joy I had received from the good news. I talked to my therapist about my excessive worrying and she asked me if worrying had ever changed the outcome of anything and I said no. That’s when I decided I was going to step back for a few weeks from my site. It was good for me to take time off. I’ve been focusing on my physical therapy and the fact that I have been able to walk more and more. I’ve been enjoying my husband and our life together. I was listening to a very sad story on the radio the other day. I started weeping and then hysterically crying, It was like a dam burst in side of me. A woman had a son born with a very rare genetic disease. From the age of 6 months her son went backwards in development and in the end died in February of this year at the age of four after having lived in hospice care for most of his life. She said people would often say to her,”I would die if I were you”, “I could never deal with having a child with a terminal illness”. The response in her mind was: no you wouldn’t die and secondly you would have to deal with it. There isn’t another option. She said people talked to her with pity and she knew deep down that she was just a reminder to them of how fragile life is. That everything can change in a moment. The moment a doctor gives you a diagnosis. The moment you look it up on-line and realize what the ramifications are. No one is invincible, no one. This woman’s story touched me not only because of the loss of her child but because of her strength. I don’t know what the future holds, none of us do, but this is my reality at the moment and I’m going to try to embrace the life I am living now. No I’m not the same person I used to be. I have days when I feel extremely depressed and don’t think I can take this anymore, but if I really think about it, I still have so many good things in my life. You and I know how fragile life is, we have a perspective so many others will never have. We know how precious the now is. This entry was posted in Grieving for the Life you Lost, True Greatness and Inspiration and tagged avascular necrosis, AVN, AVN of the hip, being disabled, bone infarcts, living with a disability, ON, ON of the hip, osteonecrosis, young and disabled by osteonecrosis77. Bookmark the permalink. All this is possible because of your blog and the information you shared. Please take comfort that because of you I was able to find a doctor who is going to help me. You have inspired me to find doctors who will help us cope with AVN and not just give us pain medicine and tell us that is all they can do. The other doctor I am seeing is Doctor Guy Paiement at Cedars Sinai hospital. They are some of the nations best doctors in this area. Anyone out there wanting help contact these doctors. I was told that my AVN is stage II on my left hip and stage III on my right hip so I am having surgery April 9 to replace my hip. Dr Snibbe is also the team doctor for the LA Lakers, the Clippers and the Kings hockey team. I will be able to stand and put weight on my leg right after surgery according to Dr Snibbe since he does not cut any muscle during surgery so my recovery should be pretty quick. This is a big step for me since I live in Texas and have been traveling to California for my dr appointments but if I can walk again and my pain is gone then it was well worth it. I will keep you posted on my surgery and the outcome but for all of you suffering from AVN don’t give up we will find help. I have Systemic Lupus and received large does of steriods. I had bi-lateral hip replacement at 22 because of AVN I am now 52, amazing I still have the original hips. I now have AVN in most of my other joints, shoulders, ankles, knees, wrist. My ankles have collapsed but In still moving around. Pain is an ongoing process. Some days are better than others. Im not sure why but I think maybe since AVN is something I have had for so long my pain is just my normal. I was on morphine time released and also immediate release. I have weaned myself off most of the morphine, I goes days without taking any pain meds. I am blessed that I can control my activity level each day. So, I stop when I hurt and move when I don’t. I did read recently that now pain levels can be seen on an MRI hopefully that will help so many that suffer with AVN. Pain is an individual experience. I wish I had answer but I don’t. I take each day as it comes, Im sure the time will come when I will need my hips replaced again but Im not looking forward to that day. I would be happy to talk or offering any help I can. I have had AVN most of my adult life..the only true advise is have patience with yourself. You will not be able to do everything the way you did before. There are ways to cope & you need to find what works best for YOU. Never ever let anyone force you or tell you the pain isnt real, it is. It is your health, your life, your pain. Consider seeing a pain specialist. Doesn’t sound like you are at any risk of addiction. You will become physically dependent, but when you don’t need the drug any longer your doctor can help you get off of it. It sounds like you’ve gotten some less than accurate advice about pain medications from your doctors. I’m a physician and also suffering from AVN of knees and ankles. This is a terribly painful disease. Chronic pain will ruin your life if you don’t take care of yourself!